Susan the Biplane flew straight though the wall and emerged in a very different space. 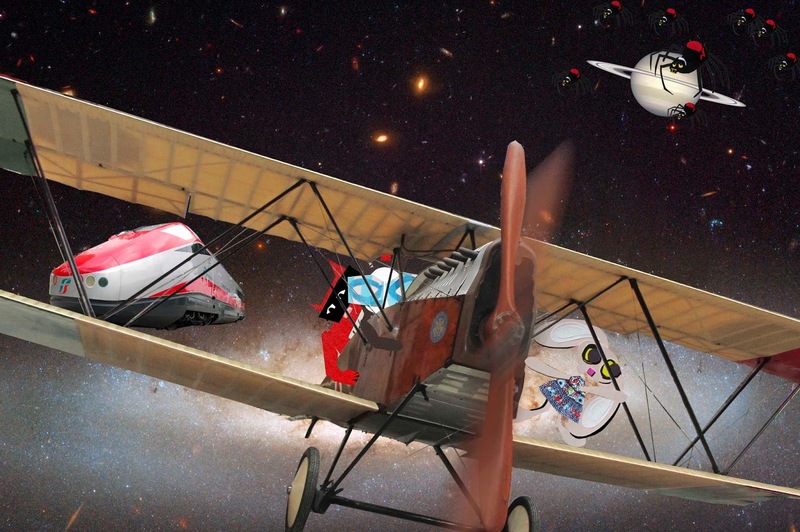 "OK," said the Wabbit, taking the controls, "what next?" Lapinette balanced on a wing because that was the only room there was. "What sector is this?" Susan banked, although that was fairly relative. "We're still in the void Ma'am, but there's a hole." "We're always in holes," sighed Lapinette. "I can transfer you," said Susan, "just give me a nanosecond." Suddenly space was full. Quantum the Time Travelling Train appeared over the horizon - if indeed you could call it a horizon - and he shimmered in the light of a strange planet. The Wabbit looked at the planet and smiled as a dozen red spiders cut across a silver dust ring. "We haven't much time," said Susan. "We're all going in. Think cargo." Quantum the Time Travelling Train turned a full circle and opened his rear doors. Susan looped the loop and flew into the hold. Marshall Duetta and her squadron of red spiders took up the rear and the doors slammed shut. Quantum vibrated as he engaged Lattice Drive and dived at the hole. The shudder was violent. Everyone felt ill. Skratch coughed up three fur balls. Lapinette's ears tangled round her legs. The Wabbit's fur polarized and he stuck to the fuselage. Duetta's spiders ejected a mass of web that filled the carriage. It was only then that Quantum spoke. "I'm afraid you're obliged to clear all this up."